If you want to see how the Newbery award has changed over the last 91 years, look no farther than one of the old winners. 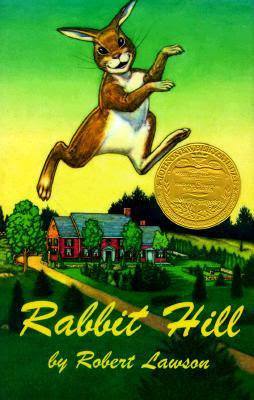 Aaron, Maxwell, and I recently finished Rabbit Hill, winner of the Newbery Medal in 1945, and, well, let's just say that times have changed (more on that in a minute). The animals are all astir on Rabbit Hill. Finally, after a vacant period and unsatisfactory owners before that, new Folks are coming to live in the farmhouse! Father Rabbit, Little Georgie, Porkey the Woodchuck, Willie the Fieldmouse, and Phewie the Skunk are bursting with excitement and anticipation. There are worries, of course, and Mother Rabbit articulates many of them, but in the end, the New Folks prove to be as near to completely perfect as can be. Rabbit Hill was cute (how could it not be with a young rabbit named Little Georgie and a skunk named Phewie? ), but I'd be lying if I didn't admit that it was a slow, tedious read. For Maxwell. For Aaron. And for me. I know we were all a little grateful when we turned the last page and closed the book. For Aaron and Max, I know one of the main obstacles to get past was the language. It was so hard for them to understand. I like to think that they have at least average vocabularies, but this was well outside their realm of comfort. "'In such an event,'" he said, "'we should merely be forced to change our place of residence. Our present location down here in the hollow, although made dear through long association, is, at certain seasons of the year, indubitably damp, not to say wet. I have noted of late a slight tendency toward gout (a family inheritance) which might be greatly benefited by a removal to a somewhat more elevated location.'" I have no problem with explaining words or sentences to the boys. I've said before that one of the reasons I love reading to them is because it gives us a chance to talk about words and learn new things. But honestly, having to explain every little thing was not only tedious, it also tragically disrupted the flow of the story. And really, when you have to take a paragraph like the one above and cut it down to "they might have to move to a drier, safer place," it somehow loses any of its original charm. So sometimes I explained, and sometimes I didn't. But when I didn't, their eyes glazed over, and I could tell their minds were definitely not on Rabbit Hill. Now, of course I realize that cutting out all of Father Rabbit's monologues would have been akin to discrimination. He was perfectly cast as the well-bred and intelligent Southerner, and I certainly wouldn't want to change that. I, for one, thought his speeches were both witty and amusing. But for three- and four-year-old boys? They just didn't work. Likewise, even when Father Rabbit wasn't speaking, the language was still difficult to understand. One of my favorite lines came after describing the summer rains when it said: "It was good weather for gardens but bad for dispositions." But I realized that even a simple sentence like that required a follow-up explanation. My huge hangup was my absurd inability to keep the story in my head. Each time we picked it up, I absolutely could not remember what had just happened or who all the animals were. This happened regardless of whether we had a few days between chapters or just a few hours. I realize this is sadly a reflection of my own inadequate ability to retain information. But, in my defense, I will say that the slow-moving (even at times, stagnant) plot must have contributed somewhat to my lack of retention. I can't tell you how many pages were spent anticipating the new Folks arrival; it went on and on, with plenty of words from Father Rabbit and crotchety old Uncle Analdas thrown in. Even in the "exciting moments" (little Georgie leaping over an enormously wide river while being chased by a dog; or later on, being hit by a car), it felt aggravatingly uneventful, like a warm summer day with the occasional fly buzzing around. There was a climax of sorts, followed by a very happy ending, but we definitely took the scenic route getting there, and the scenery wasn't all that interesting. Part of me feels disloyal making such statements since I usually vote in favor of rich character development and beautifully vivid descriptions, but I just never fell into the rhythm with this book. Honestly, I think the best part of the book (for both the boys and me) was Little Georgie's song. Man, that catchy little tune and those repeating words got stuck in our heads like you wouldn't believe. But instead of being annoying, every time we started singing them, we could totally understand how that little song could have been passed from animal to animal to human back to animal all over the Hill. When I said at the beginning of this post that times have changed, I meant it as a neutral statement. Rabbit Hill is very different from most children's books that are published today. That's not a bad thing, but it does mean that some stories just aren't as accessible now as they were then. I hope that doesn't mean that our children are dumber now than they were in 1945, but I can't help but think that in some ways, we do over-simplify things to a fault. Now does this mean that I am not going to read older books to my kids? Are you kidding me? Goodness, no! Our favorite books so far (Winnie-the-Pooh, Charlotte's Web, The Cricket in Times Square, and The Enormous Egg) have all been older titles. What's more, just after finishing Rabbit Hill, we started reading Betsy-Tacy, and it was like a breath of fresh air: still describing an older time and place with some words they didn't know, but one hundred times more engaging. I wish I could put my finger on what the difference is. Maybe one of you can. Don't get me wrong, this really is a sweet book, and I hope I haven't discouraged you from giving it a try. I think if I'd read it by myself, I would have enjoyed it more. It was just difficult for me to find it interesting when I could tell that it was going over my boys' heads. But obviously, we liked it at least a little bit or we wouldn't have kept reading. Yeah, like I mentioned, I liked "Edward, Hoppy, and Joe" by Lawson a lot better. But this post makes me feel better. We started Miss Hickory, another old Newbery, and as much as it pains me to leave a book unfinished (ever the perfectionist), I haven't bothered to mention it to the kids, and they haven't reminded me to read it, and I'm not sad about it. It's just a little too slow and dry for me. However, I have another read-aloud recommendation for you: My Father's Dragon. We also read the two sequels, but the first book is hands-down the best. And a pretty fast read. Yes, we've read it (and liked it very much). It was last year, before I started this blog, so I never posted a full review. We also read the second one, but haven't read the third one yet. I haven't actually read Rabbit Hill although I clearly remember the cover and know we had it in our bookshelf when we were kids. I can see, from your excellent description and that quote, why it was tough going! Books really have changed, as have readers. I LOVEDLOVEDLOVED Anne of Green Gables! I read the whole series multiple times. But my daughters? Although they are excellent readers with great vocabularies, they could just never get past all the language and never got caught up in the stories. And I know they are not dumber than I am - quite the contrary. Susanna - what a coincidence that you mentioned dear Anne. When I wrote the above sentence ("I usually vote in favor of rich character development and beautifully vivid descriptions"), I was specifically thinking of Anne and how much I love her but how she can be a little too wordy for some readers. I put this on my list of classics from the 1940s because I remember loving it when I was a kid. But your post makes me wonder if I read it to my boys, would they have the same reaction. Right now we are reading Betsy-Tacy and it's not very "exciting" although they are liking it (oddly, my 4 year old more so than my 8 year old). It's language is not as dense as Rabbit Hill, though. I agree that Betsy-Tacy is not incredibly exciting, but so far, my boys are enjoying it much more than Rabbit Hill, and I think it is because the language is quite a bit simpler. I've never read this book, but it reminds me of the outdated language in the Trixie Belden series (which I LOVED and still read every once in a while) -- and those are from the '60s, not the '40s! It's hard to get kids interested in books when the language seems old.